Order doorknob hangers online. Our full color custom doorknob hangers, come in a variety of sizes and cuts. 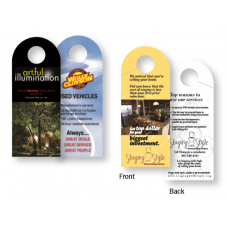 These custom doorknob hangers are perfect for hotels, advertisements and is a perfect alternative to flyers. All of our doorknob hangers come with free Canada-wide shipping and have been a hit in larger cities such as Halifax, Fredericton and Ottawa. You will have a chance to upload your image and will be mailed a proof before going to print. If you have any other questions, please don't hesitate to contact us.